Keywords have long played a central role in SEO, both as a dictatorial force responsible for shaping user search behaviors, and as a strategic focus for businesses looking to get in on the action. Originally, the mechanics of keywords were fairly straightforward; Google used the frequency of keywords as they appeared throughout the web to determine which sites were associated with which terms, and then applied keywords from user queries to that established database. In 2016, however, you need to rely on a thorough keyword strategy. Today, the use of keywords is much more complicated. Google’s algorithms have become so complex they now avoid keyword-based associations altogether. While its processes do use the presence of certain words to create a contextual construct for each website, there is a barrier of semantic processing that prevents a direct application. To explain, when you enter a query in Google, Google no longer tries to pair the keywords in your query to results on the web. Instead, it evaluates the intention behind your query, and then searches for a “best fit” candidate in its network of indexed sites. First, let me be clear; keywords are no longer valuable in the way they used to be. That is to say, optimizing for a certain keyword phrase will not help you rank directly for that keyword, to the extent that it once did. This association is a remnant of an algorithm that is many years past obsolete. Instead, creating a good keyword ranking strategy and optimizing for a group of keywords can help you refine your business’s website so that Google better understands your purpose, and can help you indirectly target more niche buyers. 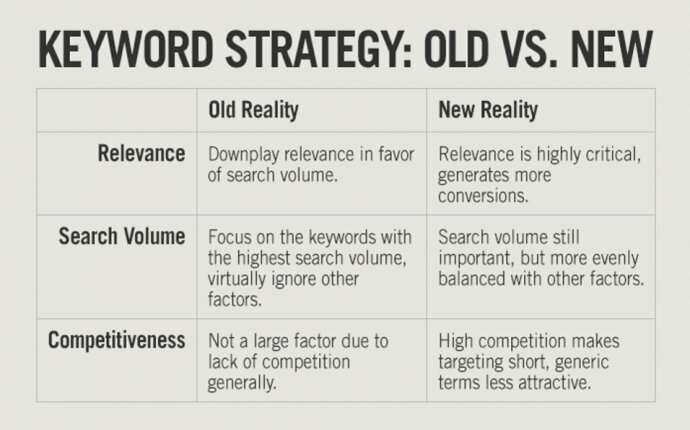 That being said, there are two main strategies you can use to select and incorporate keywords into your SEO campaign. The laser focus strategy involves a heavier emphasis on a smaller range of keywords. The idea here is to identify a handful of super strong competitors – less than 10 keywords that all have a high search volume and low competition rating, indicating that they have ample user interest but fewer companies competing for relevance in those areas. The advantage is that if you focus on these keywords strongly enough, you’re almost certain to become a top relevant brand for them, and in turn, you’ll generate more traffic. The shotgun blast strategy involves a lighter emphasis on a wider range of keywords. Rather than exhaustively researching which keywords are the best according to Google data, you’ll be selecting various pools of keywords based on certain topics. Strong shiny hair helps you look your best. Unfortunately, the nature hasn't presented really beautiful hair for everyone. What to do? Of course, use the achievements of modern science! Nowadays, there is a wide choice of various cosmetics, allowing to improve even the weakest and damaged hair. And sometimes you can really change its appearance, for example, to make curly hair straight. The most important thing is to choose the right product that won't damage your hair. Be sure, with Tutanat keratin hair straightening kit you'll get the best result without any harm for your hair.